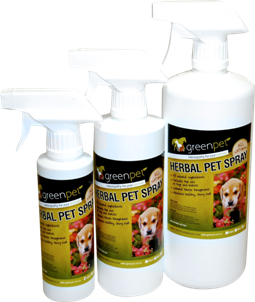 greenpet Harbal Pet Spray [GP06] - HKD188 : PetPetMaMa , The Best Products for our pets! A totally natural herbal spray for dogs. Made with only natural ingredients to leave your animal's coat smelling fresh and gentle enough to use daily. Contains aloe vera, herbal extracts, macadamia oil, witch hazel, peppermint oil, eucalyptus oil, lavender oil, lemongrass oil and fennel oil.